Today we travelled from Curitiba to Irati to learn how Conservation Agriculture has been scaled up by government and communities. EMATER made an excellent presentation in the morning (will post it later, having technical problems now), then in the afternoon the Roik family welcomed us to their 24-hectare conservation agriculture farm, where we saw demonstrations of manual and animal powered tools (see videos below). Agro-ecological info: Irati is about 900 meters above sea level and is a sub-tropical forested area. It receives approximately 1700 mm of rainfall per year (1000 in summer, 700 in winter). The sedimentary soils are very acidic with high stone content, low declivity and an abundance of steep slopes . Main crops are maize, common beans, tobacco and wheat. About half an hour’s drive from Irati town centre, in a dramatic green and hilly landscape we arrived at Vittorio Roik’s family farm. The farm is the average size for a family farm in the region, and is completely under CA cultivation. Roik’s son and daughter-in-law work on the steep hills cultivating various crops, while Roik and his wife concentrate on milk production. Today the farm is a model CA farm, used as an example by IAPAR, but ten years ago everything was different. 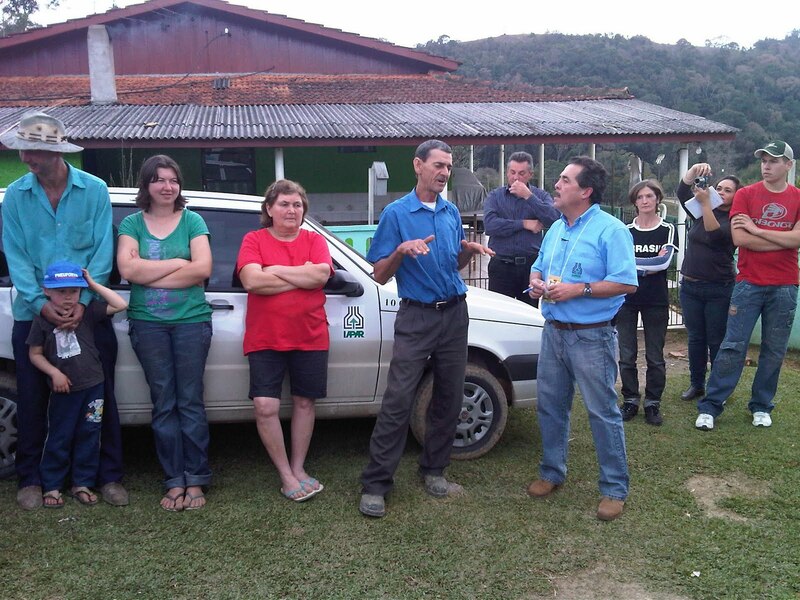 In 2001 Vittorio was invited to participate in an event organized by EMATER and IAPAR in Ponta Grossa to learn and see what CA can do to yields. He came out of the event impressed, and initially planted half hectare of maize using CA methods. Seeing significant yield increases, the family decided to adopt CA on the entire 24 hectares. This was not an easy decision, as the initial investment on the necessary equipment such as the no-till seeder and knife roller were expensive. But the family together agreed to sell their only cow in order to be able to shift completely to CA. This brave decision proved to be the right one for the Roik family. They have been able to diversify from original maize and beans to include onions, tomatoes and tobacco, and now they have over twenty heads of cattle that provide over 200 litres of milk every day. While the yields before the shift to CA on the farm averaged 2000 kg/ha, now the farm produces up to 10,000 kg/ha, an impressive improvement in the production levels. In addition to the demonstration videos, later today we will introduce three workshop participants from Tanzania (Marietha Owenya - English), Mozambique (Magalhaes Miguel - Portugues) and Mauritania (Mamadou Guye - Francais) who will share their impressions each day.